Whether you are searching for a children’s dentist, a cosmetic dentist, or just your average all-around family dentist, many people have serious anxiety issues when it comes to a routine checkup. It doesn’t have to be a root canal treatment to qualify as frightening for many people. These fears often arise in people who have never had a traumatic experience, but simply don’t like the prospect of opening their mouth while people scrape their teeth with a variety of possibly intimidating instruments. In today’s post, we will attempt to alleviate some of these fears by giving practical techniques that others have found to be helpful. There’s no way around dental hygiene; if you want to be a healthy individual, you are going to need routine checkups to ensure oral health. We want to treat these fears with proper care here at Your Downtown Dentistry, where we strive to create the ultimate comfortable and stress-free environment for our clients, both child and adult. We believe that with a bit of extra care, you can have a largely positive experience at the dentist. Having just one good visit to the dentist can turn the mental tide to the extent that you might not be dreading your next teeth cleaning appointment for a month leading up to it. So while these tips are not universal, we hope that you find some utility and comfort in their practice. Read on if you are interested in addressing your “fear of the dentist” problems with some of these simple tips! Who Is Suffering From Dental Phobia? If you aren’t one of the roughly 80 percent of Americans that have some degree of anxiety when it comes to visiting the dentist, then count yourself lucky. That statistic comes from the American Association of Endodontists, who also say that between 5 and 10 percent of adult Americans can be deemed “dental phobics”, or people who are so petrified of receiving dental treatment that they avoid it categorically. That is a serious slice of the pie right there, and not something to take lightly. What Are The Specific Fears? Fear is a funny thing, and isn’t always well formed. A hallmark of clinical therapy is to address the fear and give it a name. Once we have articulated the fear, it becomes more manageable and less chaotic. Below are some common fears associated with dental care. Feeling guilty or ashamed of the state of your own teeth – we make a point to create a positive, non-judgmental environment at Orlando’s top family dentistry, Your Downtown Dentistry. Ambivalent dentists – similar to the above point, many people are afraid of a dentist who don’t give a hoot about them. That couldn’t be further from the truth at our practice. We have a staff that cares about you, your fears, and do our best to walk through those issues alongside you. Fears of needles – That is tough. Solving that issue is well beyond the capacity of a blog post. But needles aren’t fun for anyone, so it is certainly understandable. History of abuse – this is tragic, and completely against our mission at Your Downtown Dentistry. We can only ask for the opportunity to reverse such a horrible circumstance. Vicarious fear – It’s not unheard of for children to take on their parents’ traits and beliefs. If a dental phobia has been expressed, either verbally or nonverbally, this can trickle down into the little one’s take on what to expect. Our recommendation is to do your best to not let that happen. There are, of course, other fears that we have noted mentioned above. But instead of focusing on all the negatives, of which we are sure many of our readers are well aware, let’s transition to dealing with these fears. Akin to a point we made above about articulating fear, vocalizing your specific anxieties and needs with your dental hygienist and dentist is a key foundation to have a positive experience. Not only will it (hopefully) calm you down to a degree, but it gives our staff an idea of how to best help you, and what any trigger points might be. We can customize a plan that you are comfortable with and have ownership of, which can be immensely beneficial. Bringing in a friend to support your during your appointment can also have positive ramifications. Most people flat-out feel more calm and safe when they are around someone they know and trust. Feel free to do this when you visit your favorite Orlando dentist (hint, that’s us). This might sound like an over-simplification at first glance, but telling your brain to calm down actually works. Take some deep breaths, practice your own personal relaxation techniques before the appointment, and don’t be afraid to ask for a break even during the cleaning. There’s nothing wrong with needing to take 5. If you would prefer some stress-reducing music, we can certainly accommodate you on that front as well. We want to help! 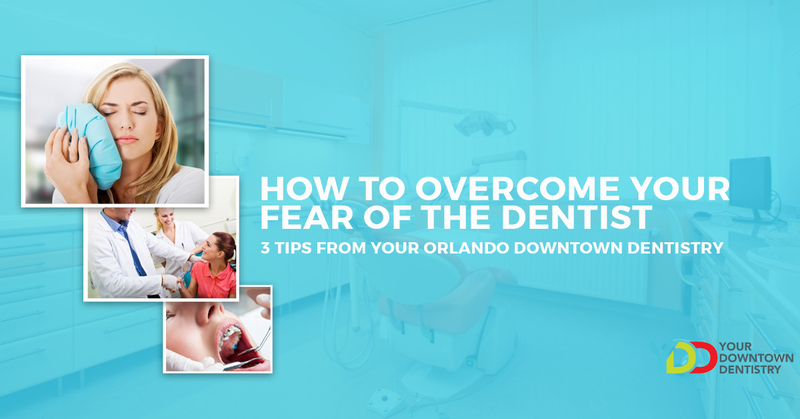 Above are your three tips for helping overcome your fear of going to the dentist. Far from a comprehensive list, we wanted to provide our prospective clients with encouragement and an understanding that you don’t have to hold onto this anxiety forever. Whether you are in need of restorative, preventive, cosmetic, or another dental service, Dr. Behzadi and the rest of our staff are expertly trained and skilled in providing you with quality care. We are all proud to be part of the finest multi-specialty family practice in Central Florida. Nikki’s testimonial is as flattering as it is telling, if you’ll allow the momentary boast. If you want to be like Nikki and achieve your most beautiful smile, we ask that you consider Your Downtown Dentistry for your next checkup. We have a passion for helping people be proud of their smile, and being able to do so in an anxiety-free way. Give us a chance to give you the healthiest, most vibrant smile you’ve ever had. Reach out to us to request an appointment today.